Wanted: Thoughts on purchasing the Buell Blast listed below. Thread: Wanted: Thoughts on purchasing the Buell Blast listed below. Hi. My name's Mark. I'm in Florida looking for my first bike to start out on. Recently came across a 2001 buell blast with 1,562mi on it, the seller is asking $1,000 USD for it. The owner seems nice and straightforward and the bike starts up ok. However, I have a few concerns. 1) 2 digits (a # and letter) are missing in the middle of the vin on the frame. Note: pic attached. Should I be worried about this? Everything else matches what's on the title he showed me. 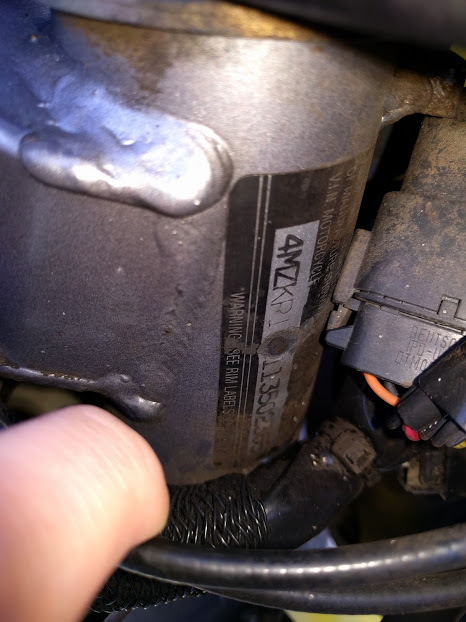 I just find it hard to believe that a plastic connector has rubbed a perfect circle out of the vin sticker. 2) If purchased, will I still be able to get this bike insured (with the vin missing 2 characters)? 3) While the front 2 blinkers work, they are held on by copious amounts of tape. He said the plastic around them had cracked from dry rot - yet the ones in the back are fine. Is this possible? Or is it more likely that this bike has been involved in some sort of accident? 4) There was a good bit of oil on the bottom of the bike. Hard to tell where exactly it was coming from though. Should I be concerned about this? Found a local mechanic that would get it safe for road driving for $200. Additional work would be $90/hr though. I've had some other people say I should try and talk him down since there's no telling what's causing the oil leak (and that will need to be repaired). Last edited by Easy Rider; 01-16-2017 at 02:36 PM. It's not worth it. If the guy didn't care enough to keep it looking nice, do you really think he cared about it enough to keep it running well? The VIN is stamped into the steering neck so you should still be able to feel the stamping. Plastic isn't gonna just rub the metal down bare. If a vin check doesn't come back as salvage/stolen. I wouldn't be too concerned about that but, the bike has definitely been down and you should plan on it needing more repairs than what he's told you about. If it only had cosmetic flaws, it might be worth $1k. With what you've described, it definitely isn't worth $1k + the money you'll have to put into it. Save up a little more $$, get a solid running bike. Welcome. Where abouts in Florida are you ?? Looks like normal wear to the VIN sticker to me. The VIN may also be stamped into the frame somewhere. If it has a Florida Title you should be OK......but they want to verify VINs on out of state transfers. If you get the title transferred, insurance shouldn't be any problem. Plastic doesn't "dry rot". Most likely an accident but if left loose sometimes vibration can fracture the mount. The best thing you can do is: Get the seller to agree to put up half of an "inspection fee" and take it to the shop BEFORE you finalize the deal. Or course you are risking half that fee too if you don't buy it. I would be a little skeptical that the mileage is REALLY that low......given some of the wear that is evident. P. S. We are having some trouble on here with fonts and colors on posts. I fixed yours so it is easier to read but would be interested in knowing HOW you posted it so that it ended up with that tiny font.